This year’s National Conference (NatCon) of the National Union of Student (NUS) is taking place this week in Geelong. Here’s everything you need to know about the NUS, NatCon, and why it matters to ANU. The National Union of Students (NUS) describes itself as the peak representative body for undergraduate students in Australia. Their stated purpose is to serve the interests of undergraduates – through advocacy, lobbying the government, and conducting campaigns, conferences, and protests. The NUS National Executive is made up of 13 officers (six of whom are paid), the presidents of each state branch (though note the ACT branch will be dissolved next year, as explained below), and 12 general executive members. Over the course of each year, they manage the activities, finances, publications, employments in the NUS, essentially implementing the policies decided at NatCon. They are elected at the conference, under an optional preferential system, where a simple majority can dictate the election outcome. The National Conference is the biggest event on the Australian student politics calendar – a week-long conference that takes place every December, where delegates from accredited universities pass policy and elect National Office Bearers. Let’s take a look at how it all works. Universities accredited to the NUS send delegates, who are decided by the student body of each university. You may recall voting for NUS Delegates in this year’s ANUSA elections (who will only in fact be observers, as discussed below). The number of votes from each university (assuming the university is financially accredited – ANU is not, this year) is based on the ‘Effective Full Time Student Load’ of their university – basically, how many students they represent. Observers can also attend NatCon, whether they be student delegates whose universities failed to financially acreddit (ANU this year), media observers (Observer will be hosting a liveblog direct from NatCon) or merely interested onlookers (who, more often than not, are factional powerbrokers). Delegates can only vote at NatCon if their university is both affiliated and accredited to the NUS. Being affiliated to the Union means that the student association is a member of the NUS, but have not necessarily paid a fee. Accreditation requires a payment to the NUS, ostensibly determined by the number of undergraduate students at the university, though this can be flexible. In past years, the fee has been $5,000 for ANU. If the university pays the fee, their delegates have voting rights. It also usually costs around $1,000 for a conference ticket (which includes accommodation and meals for 5 days), regardless of whether representatives are sent as delegates or observers. This would add to $5,000 for ANU’s five delegates, which would add to $10,000 including the accreditation fee. These fees are drawn out of the SSAF pool. In 2017, ANUSA is sending only two observers, and did not pay the accreditation fee. Student Unity (Unity): Affiliated with Labor Right, Unity has been the largest faction in recent years. Unity draws support from a number of different Labor Right factions, with its heartland in Victoria. A significant amount of Unity support is affiliated to the relatively conservative Shop, Distributive and Allied Employees Association (SDA), and are relentlessly pro-union and pro-solidarity. This year, the faction will have 44.7% of floor votes. With support from the Liberals (with whom they’ve done a deal), this gives Unity an outright majority on the conference floor, a potentially unprecedented superiority. Unity binds its voters to vote for party-approved policies and candidates, and indeed a significant number of its votes are proxied to trusted Unity delegates to avoid any chance of losing votes on the floor. National Labor Students (NLS): Affiliated with Labor Left, the NLS is generally the second largest faction, but has seen its share of voting power decline in recent years. This year, the faction will have 17% of floor votes. As discussed below, the NLS has held the NUS Presidency every year since the NUS was formed in 1987, thanks to deals with Unity, but has been the weaker partner within Labor. There were suggestions that the NLS might try to do a deal with the National Independents and SAlt this year (possibly leading to the Unity-Liberals deal), but those possibilities were rendered moot after Unity achieved a floor majority. The NLS also binds its votes. Socialist Alternative (SAlt): SAlt (also known as the Trots) are a Marxist faction that is perhaps the most combative of the lot. SAlt will hold 16.6% of the conference floor this year, slipping in just a few of votes behind the NLS. SAlt’s unrelenting focus is student activism and economic injustice, and are particularly fond of in-your-face protests. SAlt, too, bind their votes, and employ the judicious use of proxies to prevent floor revolts. National Independents (Indies): The Indies are a broad, generally progressive association of independents, who never bind votes. The Indies are formed from a number of independent student representatives across the country, who find they have more collective knowledge and bargaining power if they work as a group. They will hold 9.7% of the conference floor this year. Australian Liberal Students’ Federation (Liberals): Generally associated with the Liberal Party, despite no official links to the senior political party. The Liberals have generally had little power at NatCon, both due to a low voter base amongst students and because Liberal-controlled universities have a habit of disaffiliating from the NUS. This year, their 6.1% of votes will go to support Unity, pushing the latter to an absolute majority. Liberals have found them the particular target of verbal abuse at NatCon in a number of well publicised incidents discussed below, often perpetrated by SAlt. Grassroots Left: Generally associated with the Greens, despite no official links to the senior political party. Grassroots has seen their votes almost completely dry up over recent years, to the extent that they are sending just a handful of delegates in 2017, amounting to 2.9% of votes, and caucusing with the National Independents. Grassroots, too, do not bind votes. Despite not being a faction, there remain a number of small-i independents, whom it would be remiss to ignore. They will make up 2.9% of the floor at NatCon this year. It’s tough being an independent – bargaining power is reduced, you don’t get input into cogging (explained below), and you might even find it difficult to find out when sessions will begin each day. Factions will have pre-conference meetups before the conference begins, where they decide their positions on policies and elections, and introduce newcomers to NatCon. According to 2016 ANUSA NUS Observer Tom Kesina, “Factions send observers to blood people … to give them experience and see how NatCon works”. Factions are typically even divided by accommodation during NatCon. Factional rivalries stem from the fact that votes are predominantly controlled by factions, especially considering vote binding amongst the larger factions. Accounts of conference floor behaviour depict a climate of animosity between the factions, even including verbal and physical confrontation. At the 2015 National Conference, one ANU delegate reported instances of a Liberal speaker being drowned out by booing by SAlt members and SAlt delegates barricading the doors to stop Unity members from leaving. Honi Soit reported that a Unity delegate “aggressively shoved a rival delegate as she attempted to blockade the exit from the conference floor”. Another ANU delegate reported instances where delegates were not able to speak due to their political affiliation – Liberal delegates were shouted down on a number of occasions. So, let’s say that you want to get a policy adopted by the NUS. How does this work? Policy can be passed through NatCon or a postal ballot to campuses – this section will focus on the former method. The policy has been proposed by 2 persons who are either delegates to National Conference, national officers, state officers or General Executive Members, and National Conference resolves to consider the policy. Policy proposed in the above ways may be submitted to the General Secretary (Gen Sec) to be included in the Policy Book for the conference. This book is organised by a Pre-Conference Business Committee to amalgamate, split and redraft motions, to avoid ambiguity or repetition. This Policy Book is sent out a week or so before the conference – you can see this year’s here. Once NatCon starts, a Business Committee (BizComm) will be established, made up of seven members – representatives of factions proportionate to their presence on the floor. This year, Observer understands that BizComm will include four Unity members, one NLS member, one SAlt member, and one National Independent. There’s no guarantee that because a policy is in the policy book it will be discussed – policy has to pass through BizComm before it gets to the conference floor for a vote. Factions decide which policy will be discussed through the process of ‘cogging’. Tables are set up on the side of the conference floor for the leaders of each faction, who sign off on policies to signify their faction’s approval of a motion (before it goes to a vote). This is where eating paper infamously comes in – BizComm members have been known to on occasion hide, tear up or even eat motions repugnant to their party’s platform, to prevent them being voted on. Uncontroversial or similar motions are often put into the same policy bloc to go to a vote. Once a motion or bloc is ready to see a vote, it will be passed to the chair – who generally will be the National President, though the chair passes to the heads of departments for policy concerning said departments. Assuming the chair themselves does not eat the motion (it’s been known to happen), there will be an (often heated) discussion, and it will then come to a vote. Delegates vote by holding up their lanyards. Binding factions (Unity, NLS, SAlt) will call “[Faction] up!” to call their voters to raise their lanyards. Assuming your policy has over 50% of votes (and crucially, this year, the support of Unity) – congratulations, your motion is now NUS policy. How do elections for National Office Bearer positions work? Factions, most prominently Unity and NLS, have in the past exchanged policy votes for paid executive roles, shutting out other factions from the National Executive. In last year’s NatCon, Unity votes sat at 38% of the total floor, while NLS votes sat at around 22%. Combined, they usually constitute more than half of all votes, which is all that is needed to secure the officer roles. The so-called ‘sweetheart deal’ often made between two of the largest factions, Unity and NLS, has ensured them key positions in the National Executive. Thanks to the ‘sweetheart deal’, since the establishment of the NUS 30 years ago, every single NUS President has been an NLS member, and every single General Secretary has been a Unity member (with the exception of one). 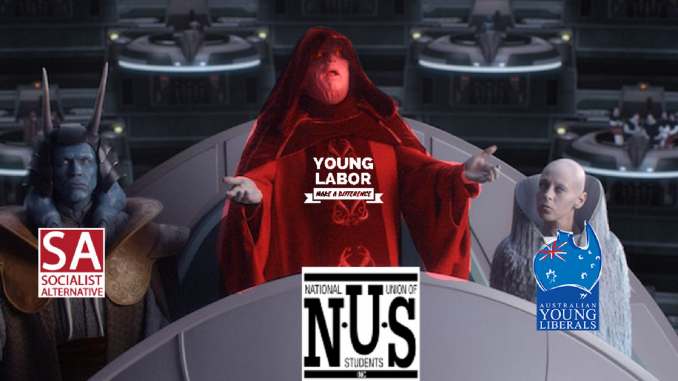 Nominally, these positions are seen as of equal status – the President controls media releases from the NUS, and the Gen Sec controls the budget. Occasionally, the ‘double sweetheart’ deal will see Unity receive the Welfare Officer role, in exchange for NLS getting the Education Officer position. Positions other than the President and Gen Sec are not always tied to the largest factions. This year, for example, the Education Officer is a SAlt member. Controversially, and in contrast to the custom of ANUSA and many other campus associations, the leaders of autonomous departments are elected by the entire voting body. For instance, the NUS LGBTI/Queer* Officer is elected by everyone, rather than just queer* identifying voters, as is the case at ANU. Different factions, however, have differing internal procedures on departments – NLS, for example, has internal caucuses for department policy and leadership. What’s so controversial about NatCon? The lack of transparency at the conference is a longstanding criticism, with filming completely banned, and barebones minutes, outlining the motion of policies without further details. Livestreaming has long been contentious – while many members have called for it individually, it has never passed as NUS policy. Inevitably, one of the first motions of every NatCon is to ban filming and photography of the conference. Last time it came to a vote, Unity and NLS opposed livestreaming, whilst the National Independents and the Liberal Students voted for it. Livestreaming is, however, allowed for officer report backs. NatCon can certainly be stressful. Honi Soit’s secret taping of the conference last year showed verbal abuse, which on top of acts of physical violence has prompted significant criticism and demand for more transparency and a full assault policy. Conference attendees have reported people jeering, trying to scream over the top of speakers, walking up to the podium to intimidate the speaker, and chanting when members of opposing factions are speaking. There is reportedly a drinking culture after the conference breaks each day, which can lead to tired and hungover delegates. The structure and agenda of the conference has also been described as confusing, with the lack of any agenda or timetable. Little guidance is given about when conference will be opening and closing each day – delegates generally have to rely on factional heads and negotiators, whilst small i independents (ie. not affiliated with the National Independents) can be left out in the cold. 2015 ANU delegate Jed Buchanan said that “Even once I learnt who to ask, most people from major faction[s]… were unable or unwilling to tell me what was going on.” Lack of agenda also resulted in certain policies not being discussed, and conference starting in the afternoon and going on until the early morning. Last year’s conference only regularly closed at 1AM because of venue restrictions – in the past, it’s gone until much later. Given 50% of delegates (and votes, which can be given to proxies) must be present for the conference to proceed, this can lead to struggles to remain quorate – even at times turning nasty. Honi Soit reported that “in past years violent confrontations have occurred when one faction has attempted to stop another from leaving the conference room by physically barring the exits”. Well, that’s a bit rough. What do we get out of the NUS, then? Whatever the faults may be of factions and NatCon, the NUS does have an impact on students. Delegates in the past have acknowledged the NUS’ influence on federal policy and change. Laura Campbell, a 2015 delegate, commended the union’s National Days of Action as “an activist platform for students to combat issues in which collective ground action is needed”. Another 2015 delegate, Jack Guadie stated that “NUS provides unquestionable benefits to ANUSA members through its lobbying, NDAs, government submissions, campus networks, information campaigns and data collection.” The nationwide Australian Human Rights Commission survey on sexual assault and harassment was in part a response to a similar survey the NUS conducted last year. What exactly is ANU’s relationship with the NUS? Because these conditions have not all been met, ANUSA has disaccredited. This means that the NUS delegates elected in the ANUSA general election in August will not have the power to vote at the conference, instead acting as ‘observers’. As a result of ANU’s disaccreditation (and the disaccreditation of the University of Canberra), the ACT State Branch will be abolished after NatCon. Out of the five elected delegates, only Howard Maclean and Harry Needham will be attending NatCon as observers. They will then provide the SRC with reports advising their decision for accreditation for 2018. These reports are highly significant due to the lack of transparency at the conference. Sometime after the release of these reports, the SRC will vote for or against accreditation for next year. Needham plans to sit with the National Independents, while MacLean will be a small i independent. Both suggest that there are problems in the NUS that need to be addressed, including the lack of transparency, accountability, and autonomous voting. This article was corrected to reflect that Howard MacLean will be sitting as a small i independent, not as a National Independent. Observer would like to thank a number of past and current delegates whose knowledge was invaluable in creating this explainer. Please email us at [email protected] if you think we’ve missed something or have something to add.